There doesn’t seem to be any two ways around Better Call Saul taking a trip to the wrong side of a courtroom in Season 3. Previous footage teased Walter White’s future lawyer getting a mugshot, and now Season 3's official key art release promises both stripes, and some “meaningful” nods to Breaking developments. 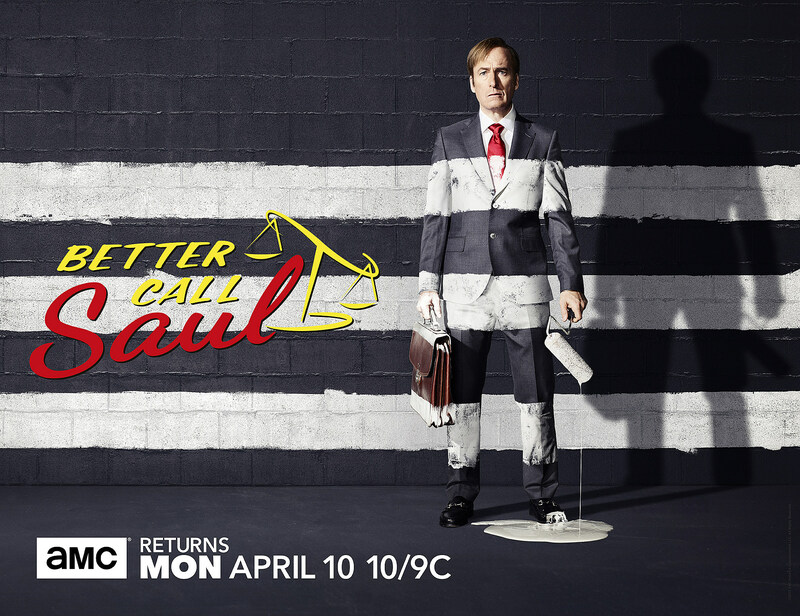 Ahead of its April 10 premiere, Better Call Saul put our first official Season 3 key art on file, featuring good ol’ Jimmy McGill either getting ready for a striped jumper, or seriously misguided about proper painting procedure. Season 3 follows the twists and turns of Jimmy McGill’s devolution toward Breaking Bad’s Saul Goodman – Albuquerque’s most notorious criminal lawyer. Six years before he meets Walter White, Jimmy is a more-or-less law-abiding, small-time attorney hustling to champion his underdog clients, build his practice, and somehow make a name for himself. As the new season begins, the repercussions of Chuck’s scheme test Jimmy and Kim’s fledgling law practices – and their romance – as never before. This imminent existential threat presses Jimmy’s faltering moral compass to the limit. Meanwhile, Mike searches for a mysterious adversary who seems to know almost everything about his business. Better Call Saul players have promised several familiar faces likely to pop up in Season 3, especially after the explicit reference to Esposito’s Breaking Bad guy. Creators Vince Gilligan and Gould had previously acknowledged fans figuring out their Season 2 title puzzle, while Bryan Cranston has also teased returning characters, and Aaron Paul may even have shot a cameo. Well, what should we expect from Better Call Saul Season 3? Will Jimmy head to jail, and emerge as Saul?